(RTC) 24C32 32K Bit I2C EEPROM memory. 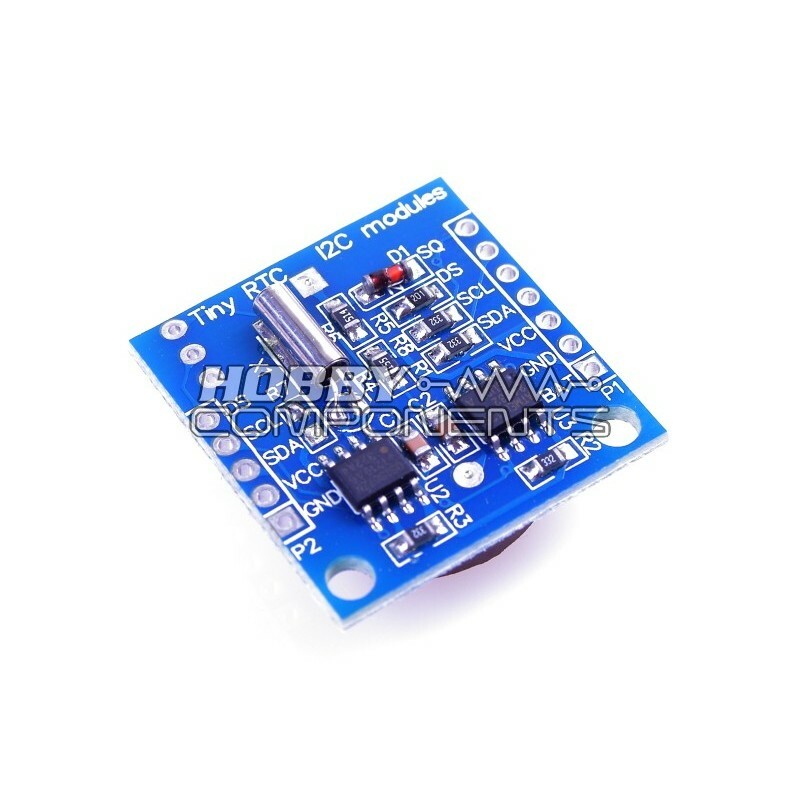 This module can be connected with other I2C devices. Exclusive Arduino library available on this support forum. What does the SQ pin do? The DS1307 has a feature where you can output a square wave to a pin. This can at fixed frequencies of 1Hz, 4KHz, 8KHz, and 32KHz. You have to configure an internal register to do this but when configured correctly the square wave will appear on the SQ pin. What does the DS pin do? If you take a look at the pictures in this post you'll notice there a unsoldered 3 pads in the top left corner. These allow you to solder an optional DS1820 temperature sensor. If you do this the DS pin provides access to its data out pin. How do I connect this module to an Arduino? I have this working fine but one small issue is that I want 2 digits to be displayed. For example the date today is 31/05/13 but the output is 31/5/13. What is the code for always outputting 2 digits? 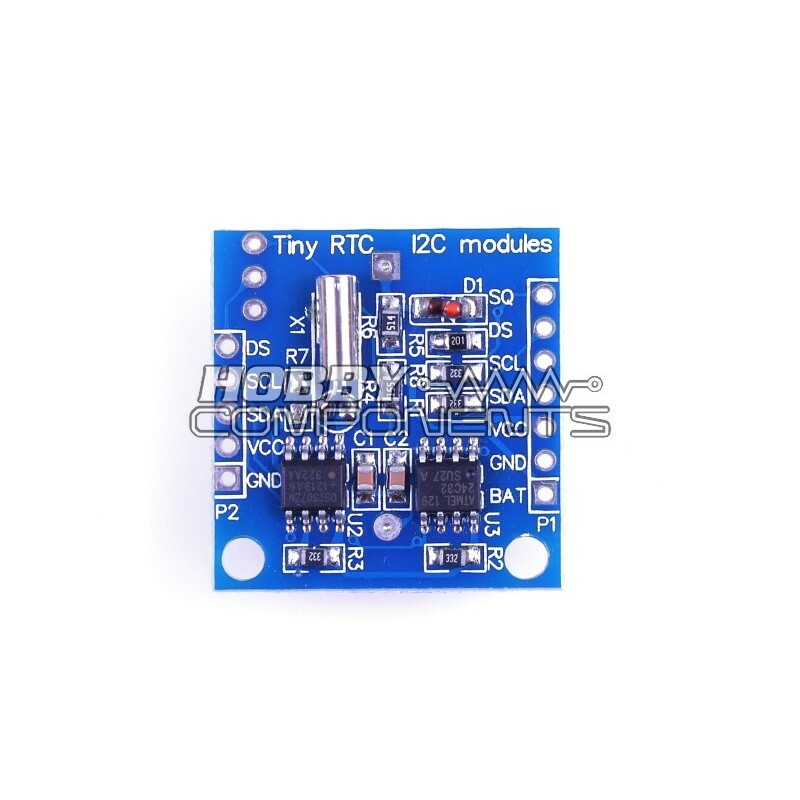 I've recently bought a Tiny RTC DS1307 module from your ebay store and I've a problem since the module loses time when I power off Arduino. I've tried with the library (HCRTC) and the example sketch that you have provided and every time I disconnect Arduino from power the time is reset to 1/1/2000. commented (otherwise every time I disconnect Arduino time will be set to that parameters). Until external power is provided to arduino the clock is ok, RTC battery level (measurem from bat pin) is 3V. Do I miss something or the RTC has some problems? From the information you have given us you don't appear to be doing anything wrong. It really does sound like the DS13072 is not getting power from the battery. The most likely cause is a bad contact in the battery holder but the fact that you can measure the battery voltage at the BAT pin suggests this is not the case. If possible, with the module not powered, could you carefully measure the voltage at pin 3 (VBAT) of the DS13072? This is the 3rd pin down from the pin marked with a dot. Thank you for your answer Andrew. I measured vbat - gnd voltage with the module disconnected and my multimeter says it is 2.94V (same voltage when module connected). The battery itself is 4.1V. Are these values ok? I've reduced my set up to only arduino and Tiny RTC module and it starts acting in another weird behaviour: it stops counting when I disconnect 5V power provided by Arduino. I really don't understand where I'm doing wrong. The pins on the lines P1 and P2 are the same (I've used P1)? I've connected SDA with A4 and SCL with A5. Sorry, I just realised my question could be misinterpreted... Would you be able to measure the voltage on the pin of the IC itself? Its the IC marked DS13072. The pin you are looking for is pin 3 which is the 3rd one down from the pin with a dot next to it. This may be a little fiddly as the pins are very close together. You will also need to do this with no power applied to the module (including IO connections from your Arduino), but with the battery connected. This will tell us if the chip itself is getting power from the battery. Everything you have said suggests that the device is not getting the battery backup. I wouldn't get too hung up about what happens when you remove the 5V supply because if we assume that the device is also not getting the 3V from the battery then it's probably just getting enough leakage current from the data pins on the Arduino, but not enough to keep the clock circuitry running. The battery voltages you measure seem sensible to me. Yes, I've already measured it on the IC (in the image I've measured voltage between pins highlighted in red) with the module disconnected from any power source (other than the module battery) obtaining 2.94V. Thanks for confirming your account. I've pulled one out of stock and it works fine with the library so it does look like you have one with a weird fault. I'm going to contact you via email to arrange a replacement or refund.